Rabat -- Dr. Yasser Soufiani, head of Ibn Sina hospital in Rabat, has denied the death of Omar Sadek, one of the 20 jobless protesters who attempted a collective self-burning on Thursday morning before the Ministry of Health in Rabat. Soufiani said that Sadek was transferred to an intensive care unit as he was suffering from third degree burns and his health status is very critical. He added that the situation of four others who had burns on their faces and hands is stable. Soufiani told Morocco Times that two women members of the unemployed group left hospital yesterday after being treated, as they had nervous breakdown and hysteria as result of seeing the protesters burn themselves alive. 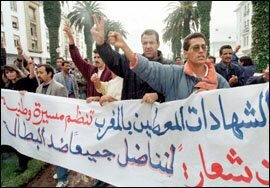 Twenty members of the National Independent Group of Unemployed Moroccans aged between 25 and 41, attempted on Thursday a colletive self-burning while protesting in front of the Ministry of Health in Rabat. Azeddine Raouchi, one of the protesters who set himself on fire, told Morocco Times “we were fed up with the government's false employment promises; that is why we have decided to burn ourselves alive so that the government may pay more attention to us, and give us our simple right, which is a job”. Raouchi said the problem goes back to Oct. 2003 when the group of unemployed started having a series of talks with government officials to solve their problems. “We had dozens of meetings with the government, but in vain. Last June, we reached an agreement with the government that half of our group, which includes 48 jobless, be employed at the Ministry of Justice and the other half at the Ministry of Interior,” he said. “However”, he added, “the Ministry of Justice kept its promises and employed 27 people, but the Ministry of Interior has ignored the other 20. And considering our miserable situation and the constant meetings without results, demanding only our rights, we have decided to burn ourselves,” he explained. Members of the National Independent Group of the Unemployed have already warned the government that they will burn themselves on Dec. 15 if the officials didn't consider their concerns. “We were called for a meeting with the Wali on Wednesday but the discussion has reached a deadlock. So the next day we soaked our clothes in petrol while protesting. The police came in quickly and started hitting us and due to the police treatment and the psychological pressure on us, we have set ourselves on fire,” Raouchi explained. Wali of Rabat and the region, Mohammed Ragraga, has confirmed in a phone conversation with Morocco Times that he held a meeting on Wednesday with members of the group of unemployed and promised them to find ways to solve their problems. He said, however, that most of them do not hold university degrees, which makes it difficult to integrate them in the job market. Unemployment in Morocco was officially 10.8 % last year, Prime Minister Driss Jettou said in September, adding that among younger graduates the figure was 26.9 %.